2nd grade math worksheets, PDF printable math activities for second graders, addition, operations, introduction to algebra. 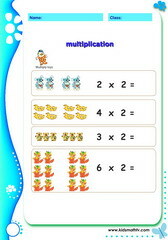 Practice Addition multi operations with this worksheet. Practice Addition and balancing equations with this worksheet. 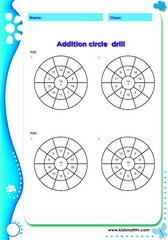 Practice Addition circle drill sheet 1 with this worksheet. Practice Addition matchup exercise 2 with this worksheet. Practice Addition matchup exercise with this worksheet. 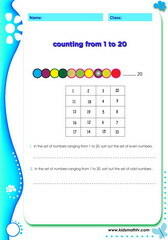 Practice Addition of 2 2 digit numbers with this worksheet. 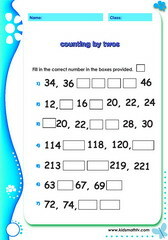 Practice Addition of 2 and 1 digit numbers with this worksheet. Practice Addition of 2 to 1 digit numbers sheet 4 with this worksheet. Practice Addition of 3 4 and 5 digit numbers with this worksheet. Practice Addition of 3 and 4 numbers with this worksheet. Practice Addition of 3 digit numbers horizontally 2 with this worksheet. Practice Addition of 3 digit numbers horizontally with this worksheet. Practice Addition of 3 to 1 digit numbers sheet 1 with this worksheet. Practice Addition of 3 to 1 digit numbers sheet 2 with this worksheet. Practice Addition of 3 to 2 digit numbers sheet 1 with this worksheet. 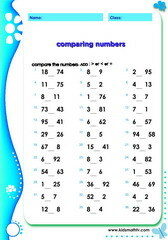 Practice Addition of 3 to 2 digit numbers sheet 2 with this worksheet. Practice Addition of 3 to 3 digit numbers sheet 1 with this worksheet. 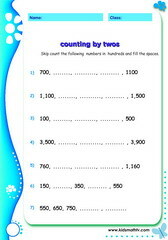 Practice Addition of 3 to 3 digit numbers sheet 2 with this worksheet. Practice Addition real life facts with this worksheet. 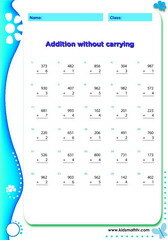 Practice Addition table drill with this worksheet. Practice Addition with brackets with this worksheet. 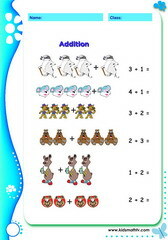 Practice Addition with illustrations up to 10 with this worksheet. 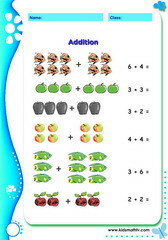 Practice Addition with illustrations up to 5 with this worksheet. Practice Addition equations word problems with this worksheet. Practice Addition find missing number with this worksheet. 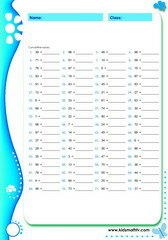 Practice Addition horizontally arranged sheet 5 with this worksheet. Practice Addition of 3 digit numbers horizontally 5 with this worksheet. Practice Addition of single digits with this worksheet. 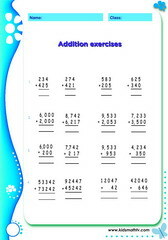 Practice Addition of thousands with this worksheet. 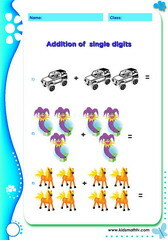 Practice Addition one digit with toys with this worksheet. Practice Multi addend operations with this worksheet. Practice Sums sentence problems with this worksheet. Practice Comparison of objects heavy or light with this worksheet. 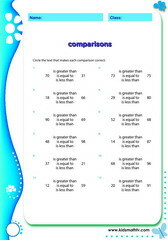 Practice Comparisons numbers up to 100 with this worksheet. Practice Comparisons worksheet 1 with this worksheet. Practice Comparisons worksheet 2 with this worksheet. Practice Comparisons worksheet 3 with this worksheet. Practice Comparisons worksheet 4 with this worksheet. Practice Comparisons worksheet 5 with this worksheet. Practice Converting arabic to roman numerals with this worksheet. 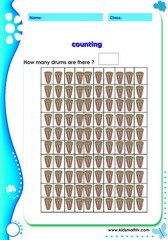 Practice Counting pattern by twos with this worksheet. 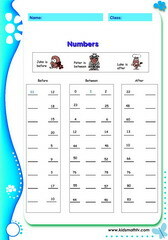 Practice Counting before after numbers with this worksheet. 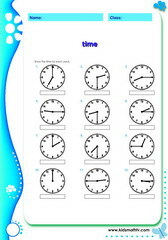 Practice Counting forward by 2 and 3 with this worksheet. 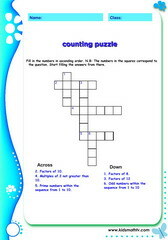 Practice Counting puzzle find factors of numbers with this worksheet. Practice Counting upto 100 with this worksheet. 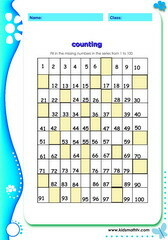 Practice Counting upto 100 missing numbers with this worksheet. 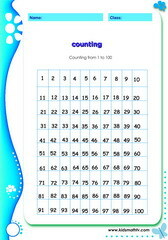 Practice Counting upto 100 with numbers with this worksheet. 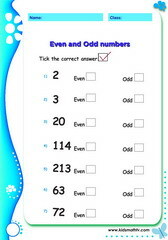 Practice Even odd numbers with this worksheet. Practice Even odd numbers 1 20 with this worksheet. Practice Inequalities in addition and subtractions with this worksheet. 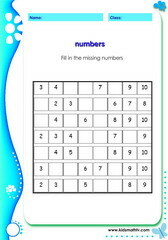 Practice Missing numbers 1 to 10 with this worksheet. Practice Number lines up to 1000 with this worksheet. Practice Number positions before between after with this worksheet. 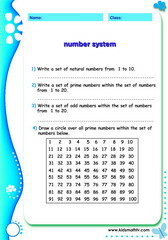 Practice Number system prime even odd with this worksheet. Practice Numbers 101 200 with this worksheet. Practice Numbers 401 410 with this worksheet. Practice Numbers fill missing number with this worksheet. Practice Numbers positions with this worksheet. Practice Ordering numbers with this worksheet. Practice Prime numbers between 1 to 100 with this worksheet. Practice Prime numbers with this worksheet. 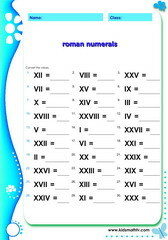 Practice Roman numerals up to 20 with this worksheet. Practice Roman numerals 1 to 10 with this worksheet. 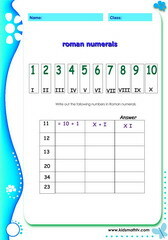 Practice Roman numerals 1 100 with this worksheet. 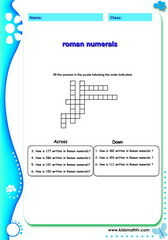 Practice Roman numerals puzzle with this worksheet. Practice Skip counting gap fills with this worksheet. Practice Skip counting in 1 2 3 4 6 with this worksheet. Practice Skip counting in hundreds with this worksheet. 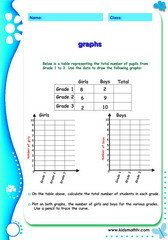 Practice Interpreting graphs with this worksheet. 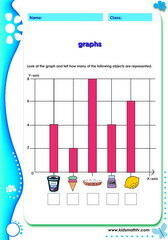 Practice Bar graphs with this worksheet. 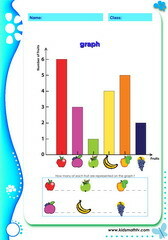 Practice Data on graphs with this worksheet. 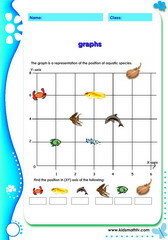 Practice Graph interpretation with this worksheet. Practice Graphs locate in x y with this worksheet. Practice Linear graph with this worksheet. Practice Ploting data on a graph with this worksheet. 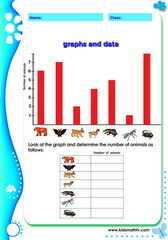 Practice Represent animals on graph with this worksheet. Practice Represent data on graph review with this worksheet. Practice Tally marks and graph with this worksheet. Practice Tally marks representation with this worksheet. Practice Venn diagrams with this worksheet. Practice Venn diagrams 2 with this worksheet. 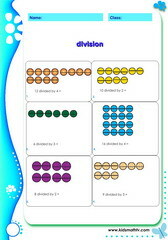 Practice Division illustrated with dots with this worksheet. Practice Division of numbers sheet 2 with this worksheet. Practice Division sheet 1 with this worksheet. 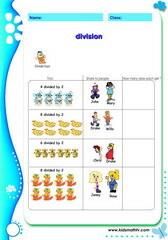 Practice Division with pictures with this worksheet. Practice Division with toys with this worksheet. 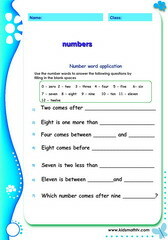 Practice Addition and estimation with this worksheet. Practice Estimation of numbers to nearest hundred with this worksheet. Practice Estimation of numbers to nearest ten with this worksheet. Practice Estimation to nearest thousand with this worksheet. 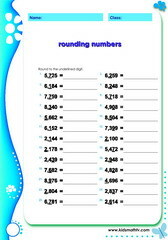 Practice Rounding up numbers with this worksheet. Practice Compare fractions with this worksheet. Practice Fraction comparisons greater less with this worksheet. Practice Fraction of circles squares with this worksheet. 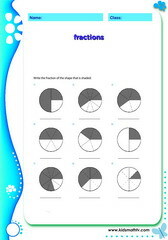 Practice Fractions illustrated with this worksheet. Practice Fractions of dots with this worksheet. Practice Fractions of objects with this worksheet. Practice Fractions shown with circles 1 with this worksheet. 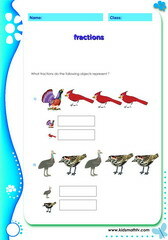 Practice Fractions with animals with this worksheet. Practice Fractions comparisons with this worksheet. Practice Fractions half quater third with this worksheet. 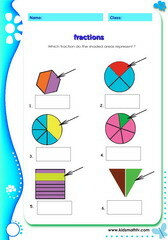 Practice Fractions vocabulary with this worksheet. 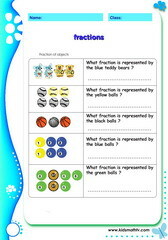 Practice Fractions with objects with this worksheet. Practice Mix shapes perimeter and area with this worksheet. Practice Congruent shapes with this worksheet. 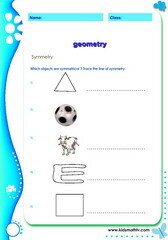 Practice Geometry symmetry with this worksheet. Practice Geometry trainagles with this worksheet. Practice Perimeter areas with this worksheet. 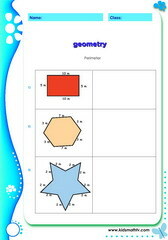 Practice Perimeter of shapes with this worksheet. Practice Symmetrical shapes with this worksheet. Practice Symmetry in shapes with this worksheet. Practice Logic word problems2 with this worksheet. 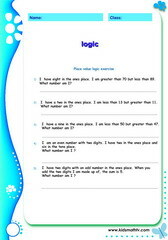 Practice Logic word problems1 with this worksheet. Practice Measure the length of lines with this worksheet. 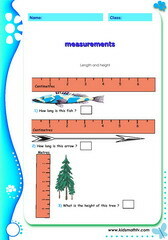 Practice Measurements using a ruler with this worksheet. 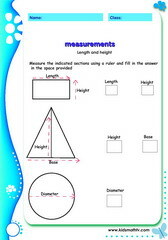 Practice Measurements of shapes with this worksheet. 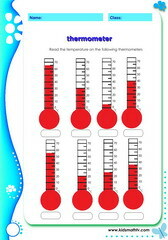 Practice Meaurements thermometer with this worksheet. 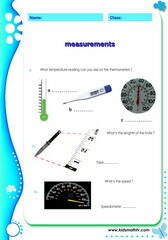 Practice Reading measurements with instruments with this worksheet. Practice Addition and subtraction matchup with this worksheet. Practice Addition brackets multiplcation with this worksheet. Practice Mixed exercises with this worksheet. Practice Mixed operations3 with this worksheet. Practice Mixed operations1 with this worksheet. Practice Mixed operations2 with this worksheet. 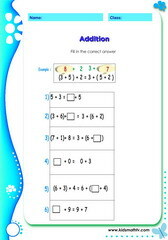 Practice Quick addition division facts with this worksheet. 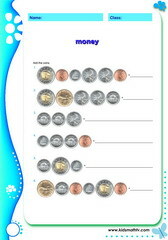 Practice Money canada3 with this worksheet. 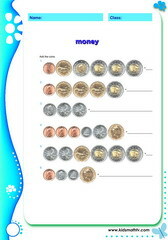 Practice Money canada4 with this worksheet. 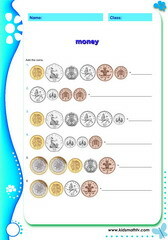 Practice Money coins usd with this worksheet. Practice Money euro word problems with this worksheet. 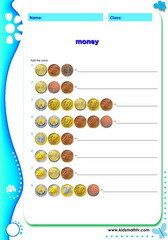 Practice Money euro1 with this worksheet. 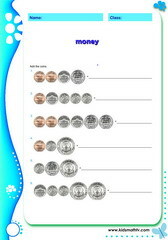 Practice Money euro2 with this worksheet. 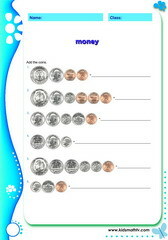 Practice Money names usd with this worksheet. 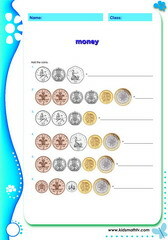 Practice Money pounds1 with this worksheet. 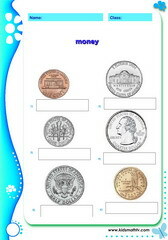 Practice Money pounds2 with this worksheet. 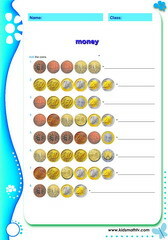 Practice Money usd 1 with this worksheet. Practice Money usd with this worksheet. 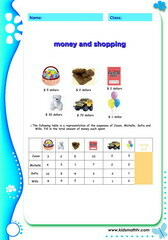 Practice Money buying items with this worksheet. Practice Multipliation illustrated with this worksheet. 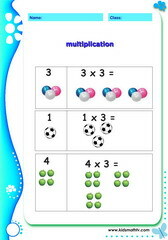 Practice Multipliation illustrated 2 with this worksheet. Practice Multipliation sentence illustrated with this worksheet. Practice Multiplication facts with this worksheet. 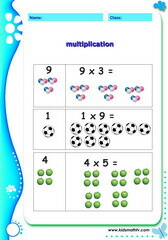 Practice Multiplication of toys with this worksheet. 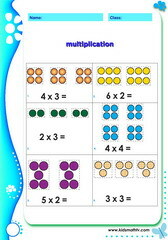 Practice Multiplication with dots with this worksheet. Practice Multiplication with strokes with this worksheet. Practice Arabic to roman numerals with this worksheet. Practice Roman to arabic numerals with this worksheet. Practice Patterns completion with this worksheet. 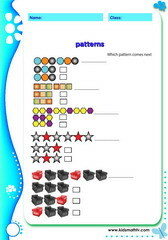 Practice Compare patterns with this worksheet. Practice Growing patterns with this worksheet. 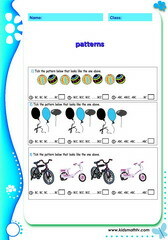 Practice Growing patterns 2 with this worksheet. 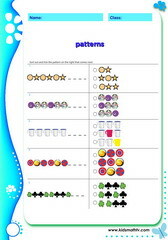 Practice Patterns illustrated with this worksheet. 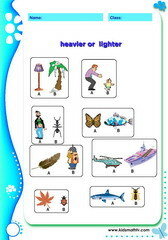 Practice Patterns with pictures and letters with this worksheet. 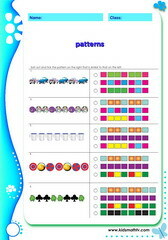 Practice Similar patterns with pictures with this worksheet. Practice Place value expanded forms with this worksheet. 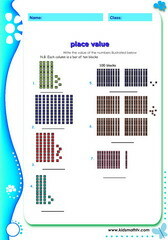 Practice Place value illustrated with blocks with this worksheet. 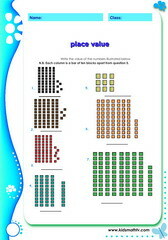 Practice Place value illustrated with boards with this worksheet. 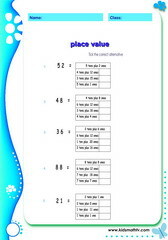 Practice Place value tens illustrated with this worksheet. 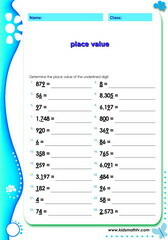 Practice Place values from ten to thousands with this worksheet. Practice Place value alternative expressions with this worksheet. 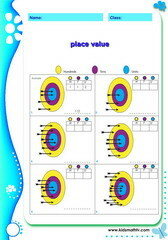 Practice Place value exercise with arrows with this worksheet. Practice Place value expanded and standard form with this worksheet. Practice Place value number word problems with this worksheet. Practice Place value with underlined numbers with this worksheet. 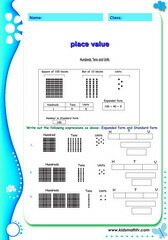 Practice Place value with blocks with this worksheet. Practice Probability balls in a box with this worksheet. 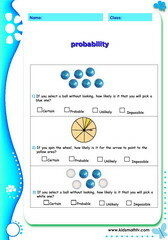 Practice Probability certain unlikely with this worksheet. 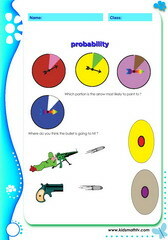 Practice Probability illustrated with spinning wheels with this worksheet. Practice Subtracting 1 from 2 digits with this worksheet. Practice Subtraction circle drill with this worksheet. Practice Subtraction facts 1 to 20 with this worksheet. Practice Subtraction facts with this worksheet. 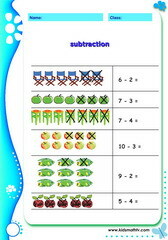 Practice Subtraction illustrated review with this worksheet. 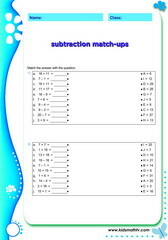 Practice Subtraction match up with this worksheet. Practice Subtraction quick facks with this worksheet. Practice Subtraction table drill 1 with this worksheet. Practice Subtraction table drill 2 with this worksheet. 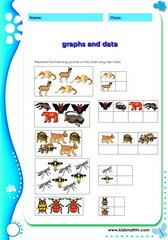 Practice Subtraction with illustrations to 10 with this worksheet. Practice Subtraction number families with this worksheet. Practice Days and months with this worksheet. 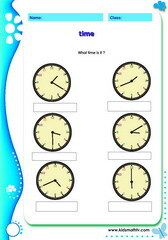 Practice Telling time on clocks with this worksheet. Practice Time 15 minutes past with this worksheet. Practice Time 5 minutes past with this worksheet. Practice Time half hour with this worksheet. 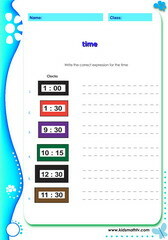 Practice Time hours past with this worksheet. Practice Time minutes past with this worksheet. Practice Time electronic clock with this worksheet. 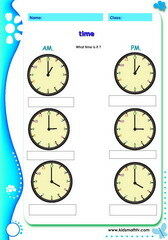 Practice Time exact hours with this worksheet. 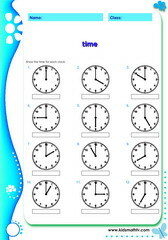 Practice Time hours minutes with this worksheet. 2nd grade math worksheets, pdf printables on: addition, operations, introduction to algebra, reproducible, addition and subtraction word problems, addition of money (US coins), numeration, counting and spelling numbers, regrouping, time word problems, math logic, place values, math puzzles and more. These 2nd grade math worksheets are suitable for parents who homeschool their kids and for teachers of secondgraders who wish to supplement their math courses. 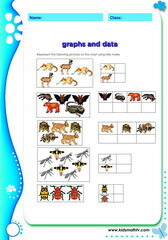 These worksheets are in PDF format and means they can be printed out and used several times. How you find this page useful for your children. Help us to spread the word if you like it.